Now for the crazy good fine print from our crazy gorgeous lawyers…no, I’m not kidding. The terms “we”, “us”, “our,” “Lise or Lisa Kuecker,” “The Phizzwizards LLC” and “Studio Grow,” refers to Studio Grow, LLC. The term the “Site” refers to studiogrow.co and all online class sites connected with Studio Grow, LLC. The term “user,” “you,” and “your,” refers to site visitors, customers, and any other users of the site. We know these aren’t glamorous names, but our lawyers don’t do glamour. Studiogrow.co provides a website where users can read articles on small business management, marketing, sales and services, and a service where users may purchase online classes, workshops, subscriptions, and products related to small business management, marketing, sales and services (the “Service”). Use of studiogrow.co, including all materials presented herein, and all online services provided by Studio Grow, LLC is subject to the following Terms and Conditions. These Terms and Conditions apply to all site visitors, customers, and all other users of the site. By using the Site or Service and/or ordering a product from the Site, you agree to these Terms and Conditions, without modification, and acknowledge reading them. Information provided on the Site and in the Service related to marketing, small business management, and other information are subject to change.Studio Grow makes no representation or warranty that the information provided, regardless of its source (the “Content”), is accurate, complete, reliable, current, or error-free. Studio Grow disclaims all liability for any inaccuracy, error or incompleteness in the Content. In order to use the Service, you are required to provide information about yourself including your name, email address, username and password, and other personal information. You agree that any registration information you give to Studio Grow will always be accurate, correct, and up to date. You must not impersonate someone else or provide account information or an email address other than your own. After all, why do you want to be anyone but you? Your account must not be used for any illegal or unauthorized purpose. You must not, in the use of the Service, violate any laws in your jurisdiction. We don’t do illegal. Studio Grow reserves the right to refuse service based on your provision of inaccurate account information. You shall not post or transmit through the Site any material which violates or infringes the rights of others, or which is threatening, abusive, defamatory, libelous, invasive of privacy or publicity rights, vulgar, obscene, profane or otherwise objectionable, contains injurious formulas, recipes, or instructions, which encourages conduct that would constitute a criminal offense, give rise to civil liability, or otherwise violate any law. If you don’t have anything nice to say, this probably isn’t the right site for you. Studio Grow reserves the right to refuse service to any order, person or entity without obligation to assign reason for doing so. Studio Grow reserves the right to limit the number of participants in any given online class or workshop. Studio Grow may at any time change or discontinue any aspect or feature of the Site or Service. All sales of digital products downloadable upon confirmation of purchase are final, including limited-time 30 day premium content. All live online workshops, courses, & trainings being given during a specific time period are eligible for refunds for up to 7 days from the first day of class, and after that time period has passed, no refunds will be given. If you’d like to cancel a monthly subscription you have with us, you can do so any time with 30 days notice, and you will not be charged effective the following month. We will keep all current payments for the month. You shall not upload, post or otherwise make available on the Site any artwork, photos or other materials (collectively “Materials”) protected by copyright, trademark or other proprietary right without the express written permission of the owner of the copyright, trademark, or other proprietary right. The burden of determining that any Materials are not so protected rests entirely with you. You shall be liable for any damage resulting from any infringement of copyrights, trademarks, or other proprietary rights, or any other harm resulting from such a submission and shall indemnify Studio Grow from any claim against Studio Grow resulting from your posting of Materials to the site. For all Materials submitted by you to the Site, you automatically represent or warrant that you have the authority to use and distribute the Materials, and that the use or display of the Materials will not violate any laws, rules, regulations, or rights of third parties. Studio Grow reserves the right to remove from the site any Materials submitted by you that it deems inappropriate for the site or that appears to violate these terms and conditions. When addressing financial matters in any of our websites, videos, newsletters, programs, or other content, we’ve taken every effort to ensure that we accurately represent our programs and their ability to grow your business and improve your life. However, the Company does not guarantee that you will get any results or earn any money using any of our ideas, tools, strategies or recommendations, and nothing on our Sites is a promise or guarantee to you of future earnings. YOU EXPRESSLY AGREE THAT YOUR USE OR INABILITY TO USE STUDIO GROW’S PRODUCT IS AT YOUR SOLE RISK. By purchasing any product produced by Studio Grow, you accept, agree, and understand that you are fully responsible for your progress and results from your participation, and that we offer no representations, warranties, or guarantees, verbally or in writing, regarding your earnings, business profit, marketing performance, audience growth, or results of any kind. You alone are responsible for your actions, and results in life, and business which are dependent on personal factors including, but not necessarily limited to, your skill, knowledge, ability, dedication, business savvy, network, and financial situation, to name just a few. You also understand that any testimonials or endorsements by our customers or audience represented on our programs, websites, content, landing pages, sales pages, or offerings have not been scientifically evaluated by us, and the results experienced by individuals may vary significantly. Any statements outlined on our websites, programs, content, and offerings are simply our opinion and thus are not guarantees or promises of actual performance. We offer no professional legal, medical, psychological or financial advice. Studio Grow does not claim ownership of Material you supply to Studio Grow. However, the act of posting Material to the site conveys an irrevocable, worldwide license to Studio Grow to use and distribute the posted Material in connection with Studio Grow’s website and any related Studio Grow publications. You retain copyright ownership and any other rights you may rightfully hold in any content that you submit through the Service. 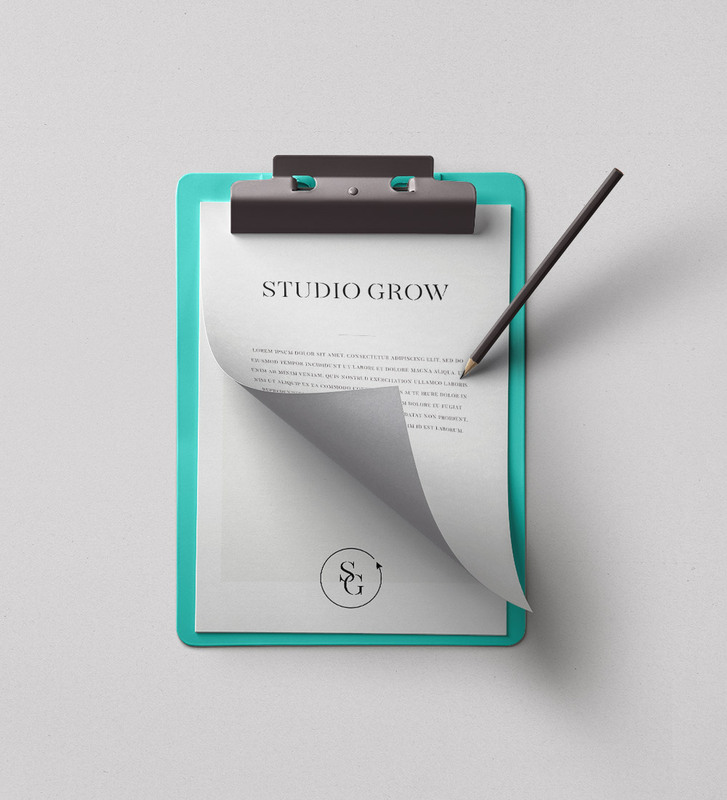 By submitting Material to Studio Grow, you agree to hold Studio Grow harmless from and against all claims, liabilities, and expenses arising out of any potential or actual copyright or trademark misappropriation or infringement claimed against you. All content provided on the Site and in the Service, including all products, and all online class and workshop materials, are the intellectual property of Studio Grow. The content of the Site and Service are protected by United States trademark, trade dress and copyright law. You may not modify, publish, transmit, participate in the transfer or sale of, create derivative works from, distribute, display, reproduce, or perform, or in any way exploit, in any format whatsoever, any of the content of the Site or the Service, in whole or in part, without our prior written consent. You may not remove any trademark, copyright, or other notice from the content of the Site or the Service. We reserve the right to immediately remove you from the Service, without refund, and to pursue all available legal remedies against you if you are caught violating this intellectual property policy. In other words, don’t steal. You agree that under no circumstances shall we be liable for direct, indirect, incidental, consequential, special, punitive, exemplary, or any other damages arising out of your use of the Site or Service. Additionally, Studio Grow is not liable for damages in connection with (i) any failure of performance, error, omission, denial of service, attack, interruption, deletion, defect, delay in operation or transmission, computer virus, online or system failure; (ii) loss of revenue, anticipated profits, business, savings, goodwill or data; and (iii) third party theft of, destruction of, unauthorized access to, alteration of, or use of your information or property, regardless of our negligence, gross negligence, failure of an essential purpose, and whether such liability arises in negligence, contract, tort, or any other theory of legal liability. The foregoing applies even if Studio Grow has been advised of the possibility of or could have foreseen the damages. In those states that do not allow the exclusion or limitation of liability for the damages, our liability is limited to the fullest possible extent permitted by law. In no event shall Studio Grow’s cumulative liability to you exceed the total purchase price of the Service you have purchased from Studio Grow, and if no purchase has been made by youStudio Grow’s cumulative liability to you shall not exceed $1. The Site and the Service contain links to third party websites and resources. You acknowledge and agree that we are not responsible or liable for the availability, accuracy, content or policies of third party websites or resources. Links to such websites or resources do not imply any endorsement by or affiliation with Studio Grow. You acknowledge sole responsibility for and assume all risk arising from your use of any such websites or resources. You shall indemnify and hold us harmless from and against any and all losses, damages, settlements, liabilities, costs, charges, assessments, and expenses, as well as third party claims and causes of action, including, without limitation, attorneys’ fees, arising out of any breach by you of any of these Terms and Conditions, or any use by you of the Site or Service. You shall provide us with such assistance, without charge, as we may request in connection with any such defense, including, without limitation, providing us with such information, documents, records and reasonable access to you, as we deem necessary. You shall not settle any third party claim or waive any defense without our prior written consent. No waiver of any of the provisions of this Agreement by Studio Grow shall be deemed, or shall constitute, a waiver of any other provision, whether or not similar, nor shall any waiver constitute a continuing waiver. No waiver shall be binding unless executed in writing by Studio Grow. All notices, requests, demands, and other communications under this Agreement shall be in writing and properly addressed as follows: Studio Grow, 111 Robinson Woods, Charlottesville, VA 22903. This Agreement shall be construed in accordance with, and governed by, the laws of the State of Minnesota as applied to contracts that are executed and performed entirely in Minnesota. The exclusive venue for any arbitration or court proceeding based on or arising out of this Agreement shall be Minneapolis, or St. Paul, MN. The parties agree to attempt to resolve any dispute, claim, or controversy arising out of or relating to this Agreement by mediation, which shall be conducted under the then current mediation procedures of The CPR Institute for Conflict Prevention & Resolution or any other procedure upon which the parties may agree. The parties further agree that their respective good faith participation in mediation is a condition precedent to pursuing any other available legal or equitable remedy, including litigation, arbitration, or other dispute resolution procedures. These Terms and Conditions bind and inure to the benefit of the parties’ successors and assigns. These Terms and Conditions are not assignable, delegable, sublicenseable or otherwise, transferable by you. Any transfer, assignment, delegation, or sublicense by you is invalid.